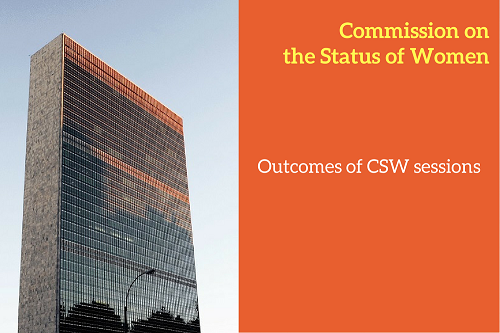 The Commission on the Status of Women (CSW) is the principal global intergovernmental body exclusively dedicated to the promotion of gender equality and the empowerment of women and girls. Established in 1946, it is a functional commission of the Economic and Social Council (ECOSOC). Every year, the CSW convenes in New York, in what is the largest annual gathering of stakeholders committed to advancing women’s human rights. On that occasion, representatives of Member States, UN entities, and civil society discuss progress and gaps in the implementation of the 1995 Beijing Declaration and Platform for Action, and the 23rd special session of the General Assembly (Beijing+5), as well as a number of issues that affect gender equality and the empowerment of women. How does ILGA engage with the Commission on the Status of Women (CSW)? As part of the organisation’s work at the Commission on the Status of Women, ILGA is committed to raise visibility and awareness of issues affecting lesbian, bisexual, trans and intersex persons. We provide expert support to partner and member organisations as they engage with the Commission on the Status of Women, and we participate actively in the CSW LBTI Caucus, a group of NGOs and human rights defenders who advocate the inclusion of the rights of lesbian, bisexual, transgender and intersex persons at the United Nations Commission on the Status of Women.